Expat birthday cards. We receive many birthday card orders from Brits abroad which we duly personalise, print and post to your relatives and friends here in the UK and elsewhere on the dates you ask us to. We thought we'd look at how many of you far-flung brits are out there, where you are and how best you can use Cool Cards. 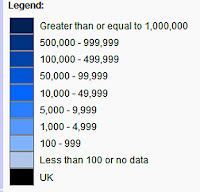 In excess of 5.5 million British-born people live outside of the United Kingdom, that's about 1 in 10 of the UK population. What? 3,750,000..? Really? 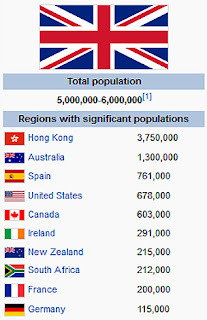 That's a lot of brits in Hong Kong..! Wiki must have got that one wrong. We've yet to receive an order from Hong Kong. Most of our expat birthday card orders from Australia, the USA and then Spain. Who uses Cool Cards abroad and Why? Expats, holiday makers, business people and forgetful people. Forgetful people? Several of our customers place a years worth of birthday card orders with us early in each year. We then print and post their cards on their chosen dates throughout the year. Other customers use Cool Cards because of the lack of local card shops and post offices, or sometimes they have difficulty getting out and about or simply they just don't have the time. But it's most likely that expats use us simply because we offer such a great service, great value and a fantastic range of greeting cards, many of which cannot be found elsewhere! Other advantages of using Cool Cards are that you don't have to allow for uncertain postal delivery times to the UK. Within the UK, Royal Mail aim to deliver over 93% of 1st Class mail items the next day. Order before 5.00pm for same-day order processing and posting. And then of course then there's the cost - you get free UK delivery with orders over £5.99 - UK orders below £5.99 are charged just £0.99. All our UK greeting cards are sent 1st Class Royal Mail. Q. I'm Bob, a forgetful expat in Australia. 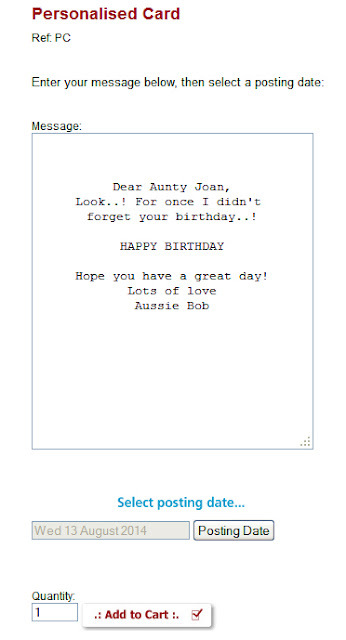 So you're saying I can order a card from you in, say, January and you'll print my birthday message and post it to Aunty Joan who lives in Edinburgh in time for her birthday in August? A. You've got it Bob. Q. I'm working in the USA, can I order from you to send a birthday card to my expat dad in Spain? A. You certainly can. We post using International Airmail. Note: International Airmail from the UK usually arrives within three days to Western Europe, four days to Eastern Europe and five days for the rest of the world. Q. Can I choose which font you use to print my message? A. Currently you can choose from 6 different fonts, but if you prefer an alternative font, just get in touch and we'll do our best to accomodate your preference. Q. Can you print my message if I write it in a language other than English? A. Yes we can, and often do. Note: You need to be careful if copying and pasting text - for example copying a poem from a webpage and pasting into our text box. Sometimes characters are copied over which aren't recognised by our system. It's always a good idea to first paste into a plain text editor, like Notepad, then from there into our text box. If you're not sure, just check your order confirmation email to check that everything looks ok.
Q. 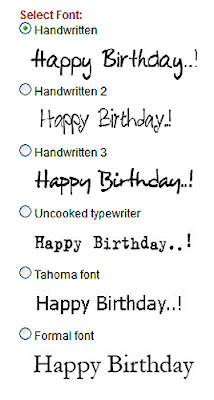 Can I place one single order for several different birthday cards to be sent on different dates to different addresses? A. No. Our system allows for one delivery address/posting date per order. You could however place one single order for several different cards to be posted to the same address on the same day. A. Is that you Bob? No problem. You can use our Postcode finder during the Cool Cards checkout process, or you can use the free Royal Mail Postcode finder. A. Hi Bob. Any questions, please do get in touch.